More than twice the amount of expected attendees came to a two-day con­ference on human per­sonhood Friday and Sat­urday when 200 people lis­tened in on lec­tures and par­tic­i­pated in dis­cus­sions. 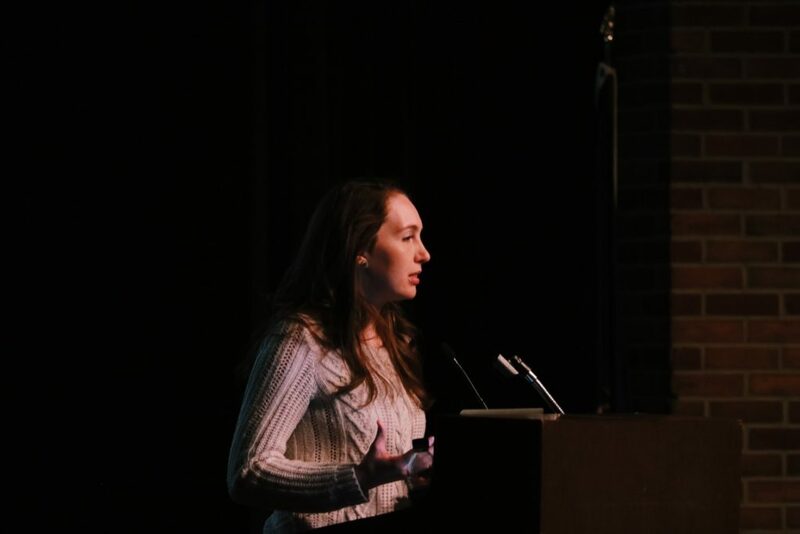 The conference’s orga­nizers senior Lillian Quinones and sopho­mores Sarah Becker, Dietrich Bals­baugh, and Caitlin Weighner part­nered with the World Youth Alliance to hold The Modern Identity Crisis: Emerging Leaders Con­ference. The con­ference explored modern bioethics and per­sonhood and further developed the meaning of what it is to be human in four inter­dis­ci­plinary breakout ses­sions. The con­ference began with a lecture by Ashley Fer­nandes, the asso­ciate director of the center for bioethics and medical human­ities at Ohio State Uni­versity College of Med­icine and an asso­ciate pro­fessor of pedi­atrics at Nationwide Children’s Hos­pital in Columbus, Ohio. Fer­nandes unfolded the morality behind physician-assisted suicide, refuting the idea that a patient’s choice, a doctor’s com­passion, or the dignity of death should allow a doctor to enable a patient in ending his own life. Later that evening, Uni­versity of South Car­olina Phi­losophy Pro­fessor Christopher Tollefsen delivered the conference’s first keynote address, speaking on “The Ethics of Med­icine and its Coun­ter­feits.” Tollefsen dis­tin­guished between two phases of medical history: old med­icine and new med­icine. Old med­icine, Tollefsen said, makes a goal of human flour­ishing, addressing bio­medical and spir­itual goods. New med­icine, however, follows only the require­ments of law, the limits of tech­nology, and the autonomous desire of the patient. “Med­icine has lost its way with no clarity as to the way it should lead,” Tollefsen said. When Fer­nandes gave his keynote speech Sat­urday afternoon, he implored the audience to “remember the person.” He begged the stu­dents in the audience to always respect the human being as they enter any career, and he empha­sized the need for Christian doctors and nurses. Alumna Naomi Vir­nelson ‘16 traveled from Case Western Reserve Uni­versity in Cleveland, Ohio, where she is pur­suing her masters degree in nursing. She came to the con­ference to learn about the ethics that could apply to her future career. While Vir­nelson attended the con­ference pri­marily for its medical impli­ca­tions, she also enjoyed the inter­dis­ci­plinary breakout ses­sions on Sat­urday morning and afternoon. Phi­losophy Pro­fessor Blake McAl­lister and Religion Pro­fessor Jordan Wales part­nered to speak on culture wars and arti­ficial intel­li­gence while Phi­losophy Pro­fessor Nathan Schlueter and his wife, Eliz­abeth Schlueter, spoke on trans­gen­derism. Later in the day, History Pro­fessor Matthew Gaetano spoke on per­sonhood in history while Phi­losophy Pro­fessor Ian Church led a dis­cussion. As Pol­itics Pro­fessor Adam Car­rington examined the right to life in the U.S. Supreme Court, phi­losophy Pro­fessor Lee Cole spoke on the person and the trinity. Senior Maria Grinis is a Spanish major on the pre-medical track. She said she attended the con­ference to be able to better answer ques­tions on ethics as she com­pletes her inter­views for medical school. “Overall, I found that the con­ference pro­vided me with a foun­da­tional under­standing of the roots of many of the heavy-hitting issues in the medical field: the right of con­science for the physician, the intrinsic nature of human dignity, the goal of med­icine to restore the patient’s full health,” she said. Junior phi­losophy major Katarina Bradford said the con­ference delighted her. After the over­whelming atten­dance at the con­ference and its clear impact on the audience, Weighner said she’s tempted to organize another one. Yes you may like the concept of assisted suicide/euthanasia but the admin­is­tration of the non-trans­parent laws in OR, WA, CA and CO brightly provide immunity for predators (cor­po­ra­tions, strangers, care­givers, heirs, guardians…) to com­plete the killing all before the family knows. The safe­guards are hollow and unen­forceable .A simple reading of the laws con­firms this to be true. I am not for that. Are you?? For more inves­tigative reports mtaas org. Resisting saves lives everyday.